Meet Ashley, the cat that adopted my brother. She started hanging around his house, following him around whenever he went outside. My brother, who never showed any interest in animals and ignored all the pets we had growing up, was smitten by her and took her in. She has since taken over the house and acts as if she was born and raised there. 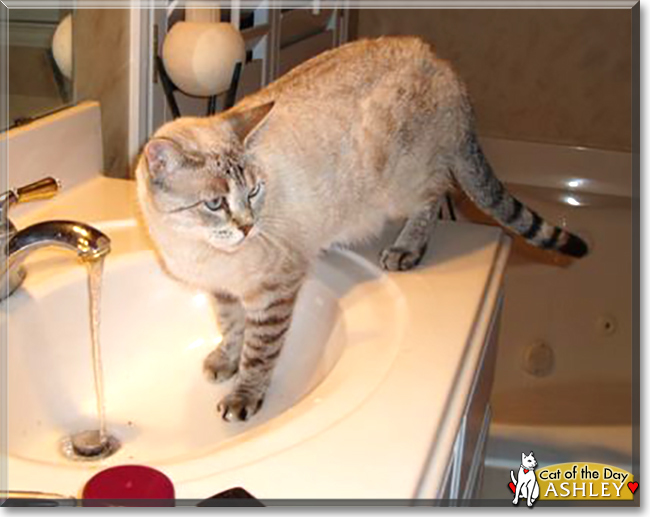 She will also only drink water from the bathroom sink, and will let you know to turn the faucet on NOW! Score one more for the Feline Fraternity! She not only made my brother into a cat lover, but trained him well! That's one special cat! Talk about Ashley in Pet Talk!